Claims of harm to New Zealand from future global warming have been made for a long time. Here are just a few to remind ourselves what we’ve been listening to for about 20 years. In 2007, IPENZ (professional engineers), MfE (Environment Ministry) and NIWA (climate scientists) held one-day courses around the country on climate change. The 7SS graph of national temperatures was used, claiming an increase during the 20th Century of 0.7 °C. They said climate change was going to affect us and “challenge the ability of engineers to plan, design and construct infrastructure and systems that will protect people from harm and maintain acceptable standards of economic well-being.” Which sounds quite serious to me. On closer examination, they also said there would be, apparently simultaneously, droughts and floods. Which to me sounds incredible. On 27 May 2008, a media release from NIWA announced new “projections” for climate change in New Zealand. Notably, it said that evidence that New Zealand is “already experiencing climate change” includes “increasing temperatures: about 0.9 ºC over the past 100 years.” That’s 0.2 °C more than the IPENZ course the previous year. The release predicted increases of about 2 °C for New Zealand by 2090. The NZ Herald quoted David Wratt saying the evidence of climate change was mounting. Now, of course, he’s all for our ETS, unique in the world for including all sectors and bringing even farmers into the filthy GHG emitters’ club. Though Wratt says the evidence is mounting, he also claims our experience of warming will be “moderated” by the great ocean we live in. That’s nice. Nothing to worry about, then. A fascinating comment by the maverick economic commentor Martin Feil. The Australian government’s Department of Climate Change is very large and top heavy. There are four deputy secretaries and 13 first assistant secretaries on its organisation chart including a first assistant secretary (Barry Sterland) responsible for an Emissions Trading Division. Many much larger and older government departments can’t match that management structure. 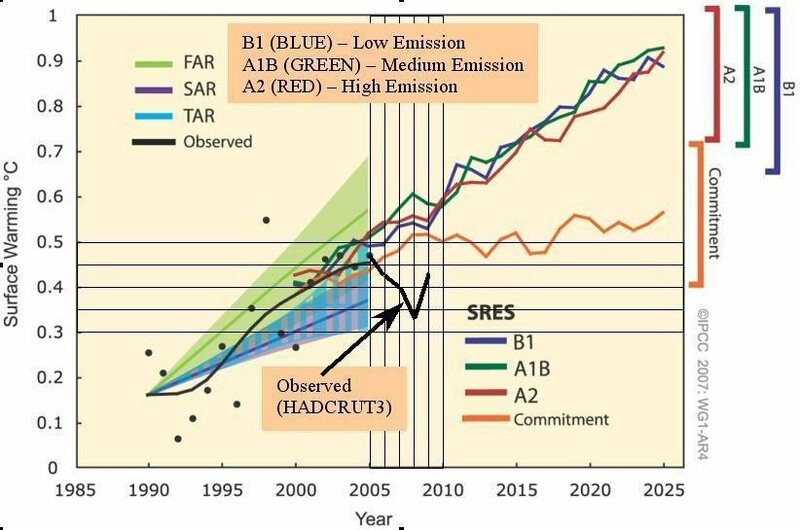 It won’t be easy to dig out the roots of the ETS but what’s the alternative? The government can’t pass the legislation now and has walked away from it. It is difficult to believe they will risk another tilt of the same financial magnitude and political risk. It would be pathetic to simply leave in place the government infrastructure (both federal and state) that was premised on the mistaken assumption that an emissions trading system was a fait accompli. Some billions of dollars have already been spent on jumping the gun. It is essential that there be some transparency in government to demonstrate that initiatives have been taken to stop the financial expenditure until such time as a mechanism is agreed in relation to the reduction of carbon emissions. It’s very difficult, if not impossible for Alpha-type people ever to admit they were wrong, and almost all pollies are Alpha types, which is why we will not be seeing any great ‘Aha’ moments of the ‘My God, I wuz wrong’ type anytime soon. An Alpha person’s role is stand at the front, beat their chests and shout out how great their insight and recieved wisdom is. My guess, and I emphasise the word ‘ guess’, is that there will be a very gradual climbdown wherein most of the more ardent supporters of the warming madness will tip-toe quietly away from it and in later years will expunge their championing of a mad cause from the records and from their own memories. Yeah, I forgot the Act party – how many of the other pollies would be able to look an Act member in the eye and admit that Act, and Rodney Hyde, were right all the time? Can’t see that happening, can you? In the land of unintended consequences (or the real world) we get this little gem from Reuters and the Guardian. Seems if industry impliments energy efficiency measures they may not need carbon credits collapsing the price… So forest landowners et al can wait until this joyful day arrives and bulldoze as much as he can in a year and repay the liability with zero cost EU units.. Just love it when a plan comes together!! “The evidence of climate change continues to mount, climate models are becoming more sophisticated, and scientific knowledge of the climate is improving all the time,” says Dr David Wratt, NIWA’s General Manager Climate Change. He would say that, wouldn’t he (especially when justifying his HPCF)? I suspect Martin Manning, Director, Climate Change, Victoria University would say that too (especially when research funding is at stake). The latest global temperature measurements are available for both satellite data  and for the Hadley CRU temperature data , so I thought it would be interesting to compare these with the predictions made in 1990 by the first IPCC report. There is now sufficient data to test whether the GCM modeling of greenhouse gases used by the IPCC really matches up to reality.